Beneath the surface gloss of Under a Killing Moon there hides a quite respectable adventure game, particularly for those of you who prefer your detective mystery stories in the style of Raymond Chandler rather than Agatha Christie or even Sir Arthur Conan Doyle. In a parody of that 1930's trench-coated, tough-guy American PI made famous by Humphrey Bogart, you control the character and play the part of Tex Murphy, a down-on-his-luck, caseless Private Investigator who finds solace only in a bottle of bourbon. Click on the photo on your desk and you learn that your predicament is all your ex-wife's fault which, at the beginning of the game at least, makes you something of a sad case. Whatever happened to taking responsibility for one's own actions? Set in 2042 after World War III in the area of what used to be San Francisco, society is divided into Norms and Mutants and, though a Norm yourself, you prefer the company of mutants - the new underclass now that racism and sexism have been eliminated. (The irony here is that in parodying the 1930's detective genre the stereotyping perpetuates the sexism that the game world claims to have overcome). After some much needed soul searching you decide that you must do something about your life and resolve to find a case, any case, that you can work on. Of course, without meaning to, you stumble into a gigantic conspiracy led by a right-wing, fundamentalist pseudo-religious group known as the Crusade for Genetic Purity that threatens the lives of all the people on Earth, your own included. So much for the plot. 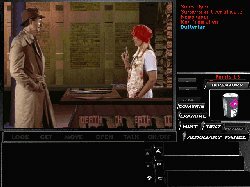 The game play itself consists of finding objects to manipulate and talking to the characters you meet to see what you can learn, or to find out what they want in exchange for information. It is advisable to save your game before talking to people because rather than simply clicking on a predetermined sentence the interface presents you with three 'attitudes' that you can strike which will elicit various responses - not all positive or helpful. You are sure to want to try out some of them just to hear what Tex says. Under a Killing Moon has a good variety of puzzles, some of which require a bit of thought, but most of them are fairly easy even without recourse to the very extensive, step by step on-line hints. The things that will probably hold you up the longest tend to be the hunt-the-pixel-to-discover-the-missing-object type problem. It seems to be a matter of catching the pixel at the right angle for it to show. The two objects that held me up were Eddie's birthday fax and Eva's computer pass, though I know other people got stuck trying to find different things. The interface takes some getting used to in that you must remember to switch between movement mode where you can 'walk' around a room and look up, down and around a full 360 degrees similar to the Underworld RPG environment; and interactive mode where you can actually do things once you have got to where you want to be. Just remember, whilst you are moving you can't interact and whilst interacting you can't move. Unlike Underworld you don't click on the screen to move, neither do you get a direction arrow, rather you just move the mouse on the mat left, right, forward, etc., watching as your perspective lurches around as if you've been drinking all day until you finally get the hang of it. You will either love or hate this feature, personally I found it a clumsy way to navigate particularly during the arcade-type dodging of the security probe in the Genetic Research building (GRS) on day 4. A good aspect of the interface though was the travel button and I would recommend this mode of getting around which, of course, can only be used once you have learned of a particular location. Fortunately, the manual is very detailed and very helpful and a thorough reading will speed you on your way. If ever an adventure game was designed to show up the inadequacies of your computer system this is it. Under a Killing Moon is a big game. It comes on four CD's and seemingly delights in telling you that your video card is not fast enough and your 486DX2 66 with 8 Mb RAM is under-powered! It also boasts full motion video with live Hollywood actors that you've actually heard of - though they only have cameo roles. For my money they could have dragged anyone in off the streets to play those parts as there was only a slightly discernible improvement in the acting compared to other 'interactive movies' on the market. Using 'name stars' may be good for publicity, and if Under a Killing Moon succeeds in attracting more people to computer games then it will have done its job, but when the gloss and hype has faded it is the game itself that has to stand alone. The graphics are, on the whole, very good though there are still too many scenes where you are conscious that the actor is standing against a blue screen and isn't really in the computer-generated setting. The sound is excellent and the music is perfectly evocative, particularly during the chapter title that heralds each new day. So, how good is Under a Killing Moon? The answer has to be a qualified success. On a powerful system with the sound piped through your stereo it is a great game to show your sceptical friends how far computer games have come and convince them to rush out and buy a machine. Or at the very least to upgrade from the old XT that they have always found to be perfectly adequate for their needs! I would certainly recommend this game to anyone new to adventuring - I only wish the interface wasn't quite so fiddly. For more seasoned adventurers it may lack the challenge, but hey - relax and enjoy the game for a change. Soak up the atmosphere and indulge the game's parody and self-depreciating humour. Although, thinking about the humour, some of it didn't work for me. I particularly felt uncomfortable with the portrayal of Ardo Newpop the not-so-gentle, 'intellectually-challenged' giant who works at the Golden Gate Hotel. And how 'clever' is Tex to make wisecracks at Ardo's expense? In terms of gameplay I found Under a Killing Moon to be much better than I anticipated given its 'interactive movie' claim to fame. After I came to grips with the interface it was very enjoyable. Though the game designers recommend 16 Mb RAM don't panic. I played it with 8 and a slow 1Mb video card. It was fine. But this doesn't mean you can relax if all you have is 8 Mb RAM - it's not going to be very long at all before nearly every game is screaming out for you to upgrade. Copyright © Gordon Aplin 1995. All rights reserved.